Kalighat pata, in watercolour and tin alloy on paper, of the Hindu goddess Durga, depicted here as the 'Mahishasuramardini'. 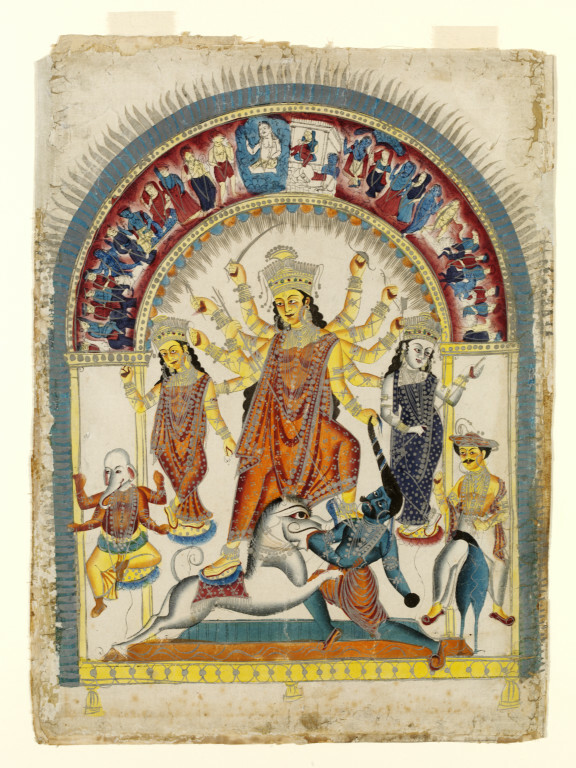 The central figure of the pata is the ten-armed form of the goddess Devi or Shakti, standing on her vehicle, the lion and is slaying the buffalo demon. The goddess is shown as holding a weapon in each of her hand. On the left hand side of the pata are the elephant-headed god Ganesh seated on a lotus and Lakshmi, the goddess of wealth standing on a lotus. On the other side are Karttik (Karttikeya) seated on his vehicle, the peacock and Saraswati, the goddess of knowledge and music also standing on a lotus. Here Karttik (Karttikeya) has been depicted as a contemporary dandy wearing a coiled headgear and representing the idea of spirit and youth. Mahishasura has emerged from the buffalo and is being attacked by the lion. 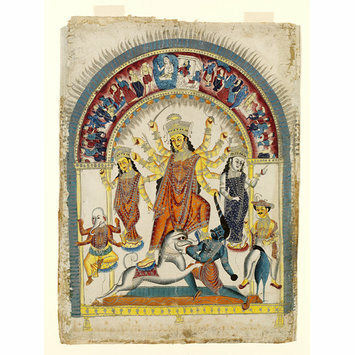 The semi-circular frieze or pata or chalchitra, forming the background includes various mythological scenes. On the frieze Shiva has been positioned immediately above the goddess, being her husband. The semi-circular frieze supported by columns represent neo-classical architectural elements which were popular features of the period in Bengal. This particular layout of the shrine, known as chalchitra is very popular in Bengal. Larger versions of the shrine are common across Bengal and also used by Hindu Bengalis elsewhere to perform annual worship rites during the autumn. The paintings of the shrine similar to the subject are often for private worshipping or for decorative purposes. Purchased from G.S. Hill, Esq. This particular layout of the 'pata', known as 'chalchitra' is very popular in Bengal. Larger shrines based on the picture are common across Bengal and also used by Hindu Bengalis elsewhere to perform annual worship rites during autumn. The 'pata' similar to the subject but framed are often used for private worshipping. pl. no. 12, cat. no. 6, vi: p.52.